Another polar vortex, another no-school day for the kids. So another cozy, cold-weather meal is in order. It was difficult to come up with a name for this dish that would capture the flavors here. It has so many things going on, but they don’t necessarily fit nicely into a category. A little bit of Mexican from the ancho chiles and the cumin, and a little bit of Asian from the star anise and the cloves, brought together by the American craft beer. At any rate, let me tell you about this delicious pork shoulder that you’re going to want to make more than once this winter. For those of you who have a fear of tackling a large cut of meat, this recipe is an ideal entry point. 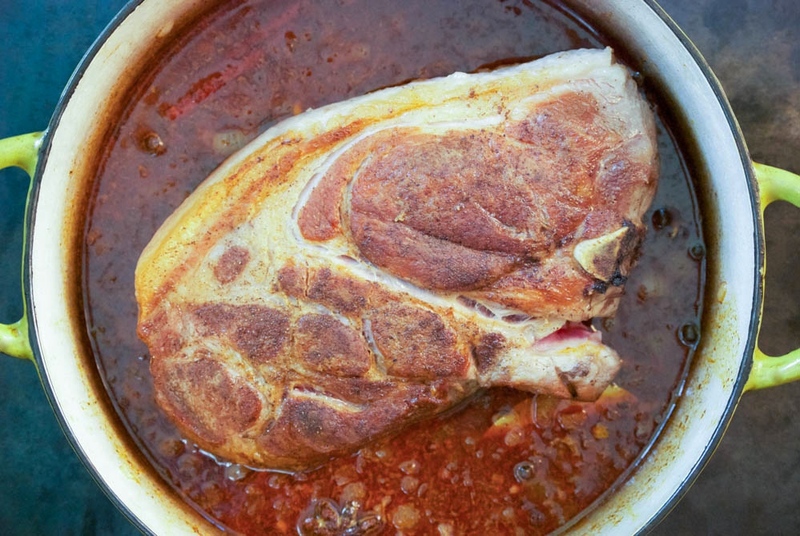 Braising a pork shoulder could not be easier and the results are dynamite. For starters, and not to sound like a broken record– please use a piece of meat that has been raised properly, preferably local. 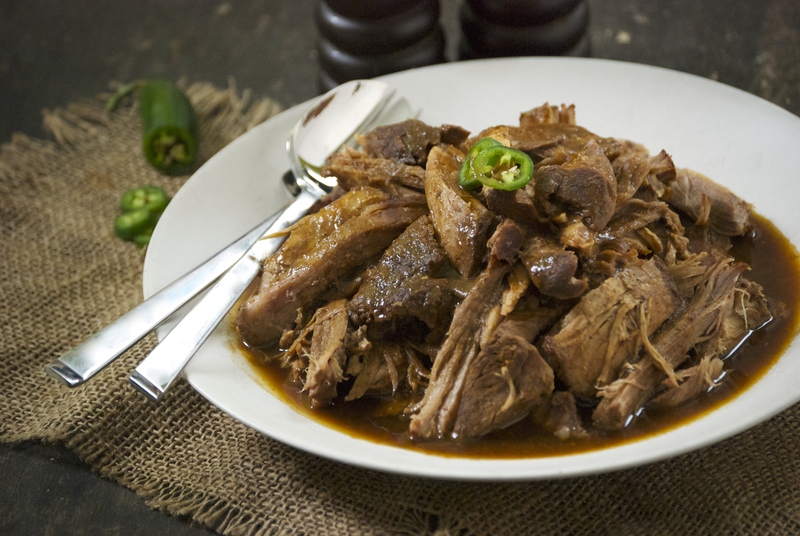 Braising can be done using any variety of liquids– broth, wine, milk, or plain water. 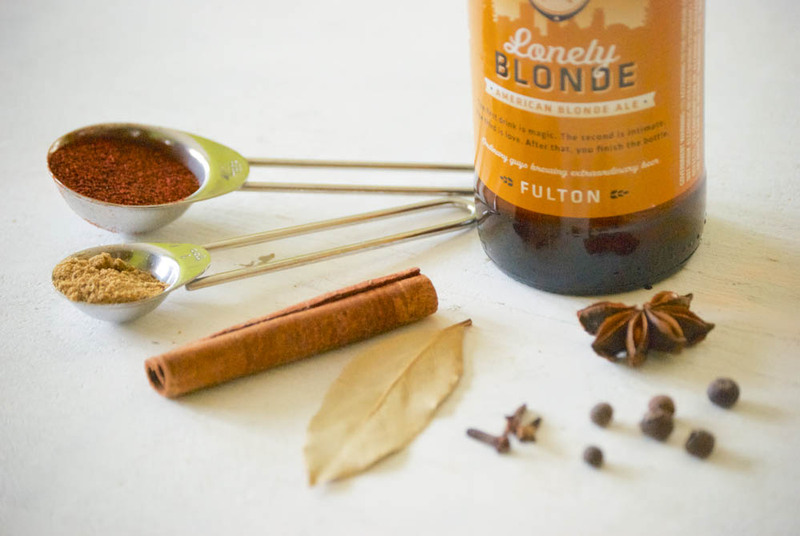 In this recipe I used a local craft beer that paired with the spices to develop a deep, wonderful flavor. The pork works wonderfully with the sweeter tones of cinnamon/cloves/star anise/and allspice. It also works well with ancho chiles and cumin. Marrying the two combinations together is fantastic. You’ll love it. Be sure to top it with a bit of fresh jalapeño– it’s not that hot and the freshness really brightens up the flavors. We generally serve the pork shoulder on top of polenta. 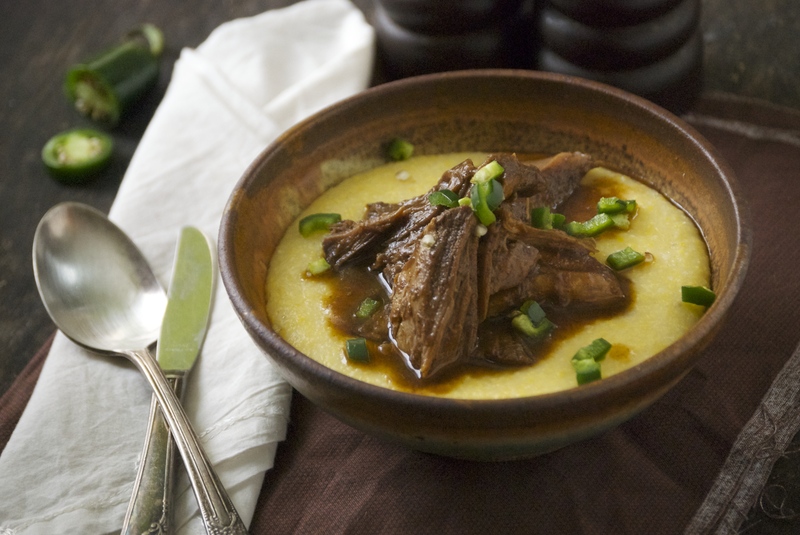 I love a creamy, hot bowl of polenta when it’s cold outside. Polenta is basically just yellow cornmeal. It’s origin is Italian and from what I gather, true Italians wouldn’t dream of putting dairy into their polenta, instead making it only with water. I’m not Italian. So, I opted for a couple pats of butter and a sprinkle of parmesan mixed in with mine. I think my Fortify friends may have influenced this a bit. You will find different variations of the grind size when buying polenta. Medium ground seems to make the most satisfying polenta. Some people think making polenta is fussy, but I haven’t found that to be the case. I do however advise you to be ready to sit down and eat the moment the polenta is done. It doesn’t stay creamy all that long before it starts to harden and become a bit clumpy. While it still maintains it’s lovely flavor, the silky texture will be lost. So, be ready to sit down at the table and enjoy this lovely meal. Pre-heat oven to 250 °F. Over a med-high flame, heat a large Dutch oven coated with olive oil until it is hot. Pat the pork shoulder dry with a paper towel and season both sides of it with salt and pepper. Place the pork in the Dutch oven and brown every side (ends, too) until a deep, dark caramel color has formed on all sides. Remove from the pot and place on a plate. In the same pot, add the onion and garlic, and a bit more olive oil, if needed. Sprinkle with salt and pepper. After about 3 minutes, add the the entire list of spices. Stir and then add the beer. Place the pork, along with any juices back into the pot. Bring to an almost boil, then remove from heat. Cover and place in the heated oven for about 3 hours. You will know when the pork is done when you touch it with a fork. It should feel tender, not tough. It should practically fall off of the bone when gently tugged at. If there is too much resistance, roast it a bit longer. Be sure to have an oven thermometer, so you know the accuracy of your oven. While the polenta is cooking, tend to the pork. When the pork is done, remove it from the pot. I like to make a smooth sauce out of the liquid, but the choice is entirely yours. You can certainly skip this step. Strain the liquid. Then pour the liquid portion into a gravy separator to remove the fat, or use a spoon to skim it from the top. Remove the cinnamon, star anise, and bay leaf and discard. Place the remaining onions and garlic into a blender. Then pour the liquid (sans fat) into the blender and blend it together (always be careful when blending hot liquids). Return the mixture to the Dutch oven and re-season with salt and pepper, if necessary. Meanwhile, separate the meat from the bone and tear it into big chunks. Place the meat into the sauce. Serve with jalapeños and polenta, if desired. This is a wonderful dish to re-warm, as the flavors deepen even more overnight. Enjoy! This looks like the absolute perfect cold weather dish; warming and hearty and substantial. Stay warm you guys!